On Saturday I headed over to Northampton parkrun for my second run since Oscar was born. Dan didn’t have a football match until later in the afternoon last weekend. So after getting up, changing and feeding Oscar, and then expressing so that Dan would be able to feed whilst I was out, (no more lying in until 7:30am on parkrun mornings!) I headed over to the Racecourse at Northampton for another week of parkrun. I was meeting my friend Steph there. Steph is currently returning from injury and the parkrun at the weekend was also one of her first runs back. (Why does everyone seem to be injured at the moment?!) Having already run since having Oscar (although for only just over a mile) I knew that I should be able to stick to Steph’s plan for parkrun, whatever that may be, despite Steph usually being a much faster runner than me – we both needed to take things easy this week. Steph informed me that she’d had a successful 20 minute run earlier in the week with a run/walk technique so we decided to go ahead and run for as long as possible without causing Steph’s knee any niggles. Our initial aim was to reach further than the mile mark. We managed to achieve this before Steph commented that she could begin to feel her knee, so we dropped down to a walk for a little while. At about 1.5 miles we tried a little jog again, but decided to drop back to a walk when Steph began to feel uncomfortable as there was no need for us to go breaking any speed records. We then walked the remainder of the event. On the final lap at the bottom corner, one of the marshals tried to gear us up by telling us that we had no excuses to be walking. I know he was only trying to be encouraging, but for some reason I felt the need to point out that I’d had a baby seven weeks earlier, and that Steph was returning from injury! We did have genuine reasons for needing to walk! 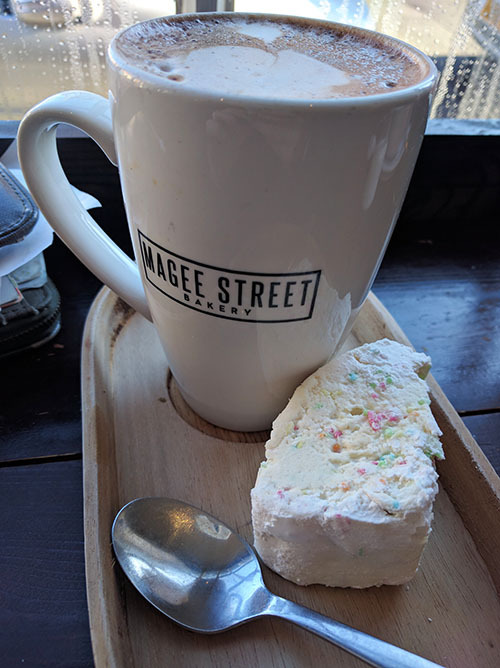 As always, a trip to Magees was had post-parkrun where I indulged in my regular salted caramel tart and hot chocolate with homemade marshmallow. The marshmallows even had sprinkles in them this week! The rest of my Saturday was spent dozing on and off with Oscar and Bella, trying desperately to catch up on missed sleep and attempting to tidy the house in-between seeing to a needy baby and a needy cat! Anna is currently putting together a compendium of personal insights into parkruns all around the country, which is a fab idea. I submitted a review of the Northampton parkrun which Anna published last week, but you can find several more parkrun reviews on her website. If you know your local parkrun quite well and fancy submitting a review for Anna’s blog, then I know she would be more than grateful, so get in touch with her via her blog. Have you ever justified a walk to a marshal/pedestrian?! A couple of times during recovery periods when I’ve been speed or hill training out on my own I’ve really wanted to pipe up about why I must look like I’m shuffling along on the footpath! Well done for the post baby parkrun! As always the cafe sounds so good after. I don’t think I’ve felt the need to explain if I have been walking instead of running, and I always feel as tail runner that I need to be careful and not get annoying by encouraging the people nearer the back too much! Yeah that’s the thing, – it needs to be a nice balance of encouragement, but also letting them dictate how much they want to do. Well Done for making it back to parkrun already! I don’t think you should have to justify yourself. parkrun encourage walkers too just as much as speedy runners and joggers. Yes this is true. It was hard when I first came back to do so knowing it had to be at a walking pace, but I’m so glad that I did. Yay well done for doing parkrun! You’re doing this so sensibly. I can’t imagine the juggling and sleep-deprived-ness you’re going through as well. So huge well done! Marshals can get a bit carried away can’t they? It’s like that saying “you never regret a workout” ummm, yes you can! If you get injured you can bitterly regret it!